(Bloomberg) This might be the most popular egg in history. 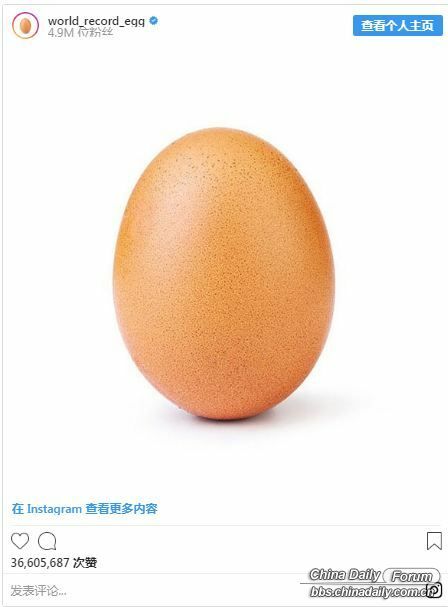 A picture of a plain, brown egg garnered more than 25 million likes on Instagram as of early Monday morning, becoming the platform’s most-liked post ever. It was first posted on Jan. 4 by an account called @world_record_egg. Jenner didn’t take the defeat lying down. She responded with her own post, cracking an egg on the street, which quickly got more than 16 million views. “Take that little egg,” she wrote. China bans Fan Bingbing, but permits the super-trashy Kardashian/Jenner clan's objective to influence Chinese youth with their extravagant and vulgar lifestyles. That's plain idiocy! That trashy clan's phenomenal fame reflects badly on the US ethos.